Kindergarten…it’s such a precious time. Your little one is starting school and so much is changing, so fast. They are going to school and discovering who they are and who they might like to be. They get a chance to try different things and to see if they might have the coordination…or learn coordination. Most kindergarten kids, aren’t especially coordinated, but sometimes they are. 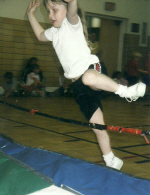 At this age, a lot of their track meet is held in the gym, where they do skill tests that have little to do with track, but everything to do with balance and coordination. Still, it can be funny, to watch these little first time jumpers. rope climbers, runners, etc. Their little legs will barely take them over the lowest rung on the high jump. They are doing their best to figure out how to get over the bar without falling on their face. And speaking of faces, their level of concentration shows so clearly on their faces. At 5 years old, my granddaughter Shai, who will tell you to this day that PE isn’t her favorite class, was already pretty convinced that track would not be her sport…if there was ever to be a sport that would be her favorite. She never did like running, or even jump rope as I recall. She is too much of a girly girl to want to do PE. Still, she did her best, and even if it never won her a first place ribbon, it won her first place in this picture…as far as her mom, my daughter, Amy is concerned. Amy told me that this picture is one of her very favorite pictures of Shai. “She just looked so cute!”, Amy would tell me. And she was so right. Shai was a cute little girl…a little out of her element, but it was the trying that captured your interest. It is the level of concentration that is most telling in how successful my granddaughter will be in her life. Shai can do anyhing she sets her mind to. She is a bit stubborn like her grandma, and yet I believe that it will be that tubbornness that will carry her to success in whatever she chooses to do in her life. Like my granddaughter, I too was very stubborn, and in fact still am. I hate to lose, and I will keep trying until I win. That is what I expect my granddaughter will be like too. Still, the choice will be hers. She will have to choose to put that stubbornness to good use…to be so stubborn that she will stay with a thing until she masters it. I believe she will do just that.